Diekirch (Luxembourgish: Dikrech; from Diet-Kirch, i.e. 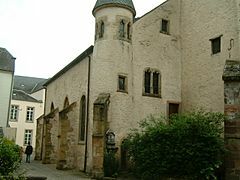 "people's church") is a commune with city status in north-eastern Luxembourg, capital city of the canton Diekirch and the district of Diekirch. The city is situated on the banks of the Sauer river. The National Museum of Military History of Luxembourg is in Diekirch. Diekirch is mentioned in 938 as Theochirica and then as Diecirke in 1182 and Diekirke in 1221. The word Diekirch means, in Luxembourgish, "people's church". The town of Diekirch, which lies in the south of the commune, has an area of 12.42 km2 (4.8 sq mi). The altitude is 187–396 m (614–1,299 ft) high. At the church, the altitude is 200 m (660 ft) high. Diekirch is surrounded by four communes: Tandel (Vianden canton) to the north, Bettendorf to the east, Vallée de l'Ernz to the south, and Erpeldange to the west. 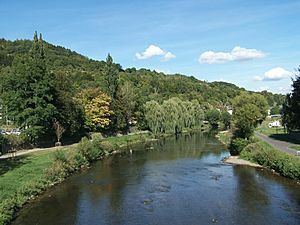 The most important river is the Sauer (German, Luxembourgish) or Sûre (French) that flows through the city. As of 1 January 2016 (2016 -01-01)[update], there are 6,896 persons living in the commune, for a population density of 555.2 inhabitants/km2. The town's mascot is the donkey. There is a donkey fountain in the centre of Diekirch. Diekirch Facts for Kids. Kiddle Encyclopedia.